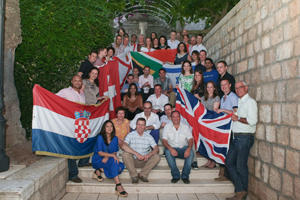 The wealth management company headed to Dubrovnik for its reward and recognition programme. Pre-event planning: Agency Principal Promotions was hired to organise a reward and recognition programme for a select group of employees from wealth management and advisory provider The Stonehage Group. The company wanted a destination with exciting activity options and Athens, Venice and Dubrovnik were shortlisted. The latter was chosen because of the range of activities on offer, while the Grand Villa Argentina had ample space for drinks receptions, lunch and a barbecue dinner. Objectives: The key aim of the event was to reward and recognise those employees who had worked at the firm for at least three years, for a consistent high-level performance, themed around the core business message of 'the client experience'. It was also an opportunity to bring together employees from offices all over the world, some of whom had never met each other face to face. Challenges: Principal Promotions needed to strike a balance between hosting a worthwhile recognition programme that reflected key business messages, while also ensuring that the delegates had an enjoyable time. It also had to source activities that suited the different age groups represented. Solution: Key messages were incorporated through a team-building activity, while optional activities ensured that delegates could choose what suited them best. Upon arrival, the group enjoyed a welcome barbecue, with the next day consisting of a half-day team-building activity, buffet lunch and an afternoon of free time, with the options of spa treatments or a city tour, followed by a gala dinner held at East West Beach Club. On the third day, a car rally was held in Dubrovnik and Montenegro, including lunch en route, with a drinks reception followed by a traditional Croatian dinner in the evening at Dubravka restaurant. Delegates spent the following morning enjoying a cooking lesson at the hotel or additional spa treatments, before departing. Post-event analysis: This is the second year that Principal Promotions has worked with The Stonehage Group on this event. Marguerite Mastenbroek, director of marketing at The Stonehage Group, says the agency brought knowledge, experience and ideas to make the event a success. "We gave strict budgetary targets which the agency met through constant negotiation and by making a continued effort to help us find value," she says. The Stonehage Group sent out a feedback questionnaire, allowing delegates to rate different components. Feedback was excellent across the board, with members of the group saying they loved the event. Croatia: will joining the EU affect its C&I appeal?